The technology of pneumatics has gained tremendous importance in the field of workplace rationalization and automation from old-fashioned timber works and coal mines to modern machine shops and space robots. It is therefore important that technicians and engineers should have a good knowledge of pneumatic system, air operated valves and accessories. The air is compressed in an air compressor and from the compressor plant the flow medium is transmitted to the pneumatic cylinder through a well laid pipe line system. To maintain optimum efficiency of pneumatic system, it is of vital importance that pressure drop between generation and consumption of compressed air is kept very low. The aim is to design and develop a control system based an intelligent electronically controlled automotive braking system is called “INTELLIGENT REVERSE BRAKING SYSTEM”. Sensor Operated Pneumatic Brake is consists of IR transmitter and Receiver circuit, Control Unit, Pneumatic breaking system. The IR sensor is used to detect the obstacle. There is any obstacle in the path, the IR sensor senses the obstacle and giving the control signal to the breaking system. 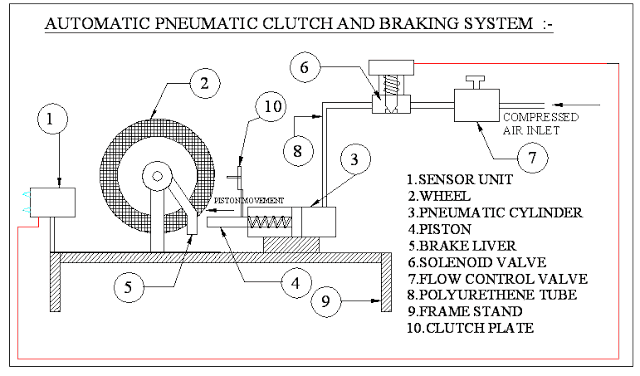 The pneumatic breaking system is used to break the system. The IR TRANSMITTER circuit is to transmitter the Infra-Red rays. If any obstacle is there in a path, the Infra-Red rays reflected. This reflected Infra-Red rays are received by the receiver circuit is called “IR RECEIVER”. The IR receiver circuit receives the reflected IR rays and giving the control signal to the control circuit. The control circuit is used to activate the solenoid valve. The operating principle of solenoid valve is already explained in the above chapter. Brake cost will be less. Less skill technicians is sufficient to operate. It gives simplified very operation. Installation is simplified very much. To avoid other burnable interactions viz.… (Diaphragm) is not used. Less time and more profit.